The DZero experiment, like all such general-purpose particle detectors, is built from a number of distinct subsystems, each designed to perform a specific task. One such component is the muon system, which forms the outermost layer of the detector. Its job is to identify muons from proton-antiproton collisions and measure their trajectories and timing information for use in both the trigger and the subsequent event reconstruction. In fact, the muon system is itself divided into two complementary parts: three muon tracking layers and three interleaved layers of muon scintillators. The tracking layers provide precise information about the location of muons as they leave the detector, which is used to build the trajectories. The scintillators measure the times that the muons pass through, with excellent precision of less than 1 nanosecond. Together, this is all the information necessary to fully reconstruct muons in the event. A recent limited-authorship publication describes the performance of the muon scintillator counters in the forward region, demonstrating both the excellent performance and the methods used to monitor the system. Each layer of forward muon scintillator counters forms an overlapping (“fish-scaled”) set of aluminum-covered plastic plates, which produce a burst of visible light photons when a muon passes through. This light is then fed into photon counters and converted to an electric current. Because the detection medium is light-based, the information is available very soon after the initial proton-antiproton collision and is hence used to make a decision about whether or not to save (trigger) the event for later use. Triggering is essential to select the roughly 100 events per second that can be saved to tape, out of the several million proton-antiproton collisions in this time. The timing information is also essential for identifying muons from cosmic-ray sources, which must be removed from the data sample. If a cosmic muon passes directly through the detector, it can look much like a pair of muons originating from the center. However, it will hit the top of the detector around 30 nanoseconds before the bottom, while a genuine muon pair produced in the collision will arrive at the muon system concurrently. By using appropriate timing windows, cosmic-ray muons can be almost completely eliminated from the data without significant reduction of signal efficiency. Scientists measured the performance of the forward muon scintillators regularly using a variety of independent methods. The efficiency of the light collection components was tested on a daily basis using built-in LED sources. The scintillating plastic plates were tested with radioactive beta ray (electron) sources. The overall performance of the full system was also tested using reconstructed muons identified by the muon tracking system. All methods show consistent results: a very slow reduction in the signal sizes over time, expected due to the effects of radiation aging. This slow change was anticipated during the detector design and had no effect on the muon identification efficiency. Overall, the detector performed very well during its entire life, with typically over 99.9 percent of counters working during data collection, and its excellent design provided extended spatial coverage and outstanding trigger capabilities. Scientists working on the world’s leading particle collider experiments have joined forces, combined their data and produced the first joint result from Fermilab’s Tevatron and CERN’s Large Hadron Collider (LHC), past and current holders of the record for most powerful particle collider on Earth. Scientists from the four experiments involved—ATLAS, CDF, CMS and DZero—announced their joint findings on the mass of the top quark today at the Rencontres de Moriond international physics conference in Italy. 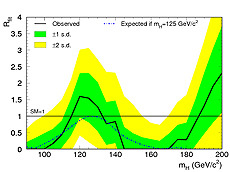 Together the four experiments pooled their data analysis power to arrive at a new world’s best value for the mass of the top quark of 173.34 plus/minus 0.76 GeV/c2. Experiments at the LHC at the CERN laboratory in Geneva, Switzerland and the Tevatron collider at Fermilab near Chicago in Illinois, USA are the only ones that have ever seen top quarks—the heaviest elementary particles ever observed. The top quark’s huge mass (more than 100 times that of the proton) makes it one of the most important tools in the physicists’ quest to understand the nature of the universe. The new precise value of the top-quark mass will allow scientists to test further the mathematical framework that describes the quantum connections between the top quark, the Higgs particle and the carrier of the electroweak force, the W boson. Theorists will explore how the new, more precise value will change predictions regarding the stability of the Higgs field and its effects on the evolution of the universe. It will also allow scientists to look for inconsistencies in the Standard Model of particle physics – searching for hints of new physics that will lead to a better understanding of the nature of the universe. A total of more than six thousand scientists from more than 50 countries participate in the four experimental collaborations. The CDF and DZero experiments discovered the top quark in 1995, and the Tevatron produced about 300,000 top quark events during its 25-year lifetime, completed in 2011. Since it started collider physics operations in 2009, the LHC has produced close to 18 million events with top quarks, making it the world’s leading top quark factory. Each of the four collaborations previously released their individual top-quark mass measurements. Combining them together required close collaboration between the four experiments, understanding in detail each other’s techniques and uncertainties. Each experiment measured the top-quark mass using several different methods by analysing different top quark decay channels, using sophisticated analysis techniques developed and improved over more than 20 years of top quark research beginning at the Tevatron and continuing at the LHC. The Tevatron data set, collected from proton-antiproton collisions, gives access to some unique precision tests of the Standard Model. In the Standard Model, pairs of top-antitop quarks are produced with a known directional bias in proton-antiproton collisions, with the top (antitop) quark following the (anti)proton direction slightly more than half of the time. By measuring the angular distributions of leptons (muons and electrons) from top quark decays, this dependence can be rigorously tested. This measurement finds good agreement between the data and Standard Model predictions (MC@NLO), as shown by the plot on the left. One helpful property of the collision environment is the existence of distinct proton and antiproton directions, allowing the directional preferences of matter and antimatter production to be measured. One can classify particle production as “forward” (for example, positively charged particles following the proton direction and negatively charged particles following the antiproton direction) or “backward” (vice versa). One can then create a class of “forward-backward” asymmetry observables, which can be explored in searches for new physics. The DZero collaboration recently published a new measurement of one such directional asymmetry, from top-antitop quark pair production. To first order, the Standard Model predicts top-antitop production to be forward-backward symmetric. However, higher-order effects introduce a small asymmetry, of a few percent, meaning that (anti)top quarks tend to be produced along the (anti)proton beam direction. Other theories beyond the Standard Model, such as so-called axigluon models, can give significant departures from the Standard Model values, generally increasing the asymmetries to larger values. For this publication, the top and antitop quarks are both selected in the lepton channel, in particular, in their decays to a muon or electron. Rather than try to infer the direction of the original (anti)top quark, we use the directions of the charged leptons originating from the decay products of the original top and antitop quarks. For this analysis, we looked at original (anti)top quark decaying into either a muon or electron (its charge depending on whether it decayed from a top or an antitop), an undetected neutrino and a b quark jet. This decay pattern is very distinctive, giving a sample signal purity exceeding 80 percent. Both muons and electrons leave extended signatures in the detector, meaning that their trajectories are known with excellent precision, and the correspondence between the lepton and top quark direction is well-understood. In fact, this paper measures two separate asymmetry parameters: a single lepton asymmetry (for example, how often the positive lepton follows the proton direction versus the antiproton direction) and a similarly defined dilepton asymmetry. The two quantities are highly correlated, but both their individual values and their ratio are precisely predicted by the Standard Model. After subtracting the contributions from various background processes and accounting for apparent asymmetries caused by detector effects, the final results are found to agree with the Standard Model predictions. Two possible axigluon models in particular are disfavored by the data. Stay tuned for more measurements of similar top quark asymmetries from DZero in the coming weeks. Scientists on the CDF and DZero experiments at the U.S. Department of Energy’s Fermi National Accelerator Laboratory have announced that they have found the final predicted way of creating a top quark, completing a picture of this particle nearly 20 years in the making. The two collaborations jointly announced on Friday, Feb. 21, that they had observed one of the rarest methods of producing the elementary particle — creating a single top quark through the weak nuclear force, in what is called the s-channel. For this analysis, scientists from the CDF and DZero collaborations sifted through data from more than 500 trillion proton-antiproton collisions produced by the Tevatron from 2001 to 2011. They identified about 40 particle collisions in which the weak nuclear force produced single top quarks in conjunction with single bottom quarks. Top quarks are the heaviest and among the most puzzling elementary particles. They weigh even more than the Higgs boson — as much as an atom of gold — and only two machines have ever produced them: Fermilab’s Tevatron and the Large Hadron Collider at CERN. There are several ways to produce them, as predicted by the theoretical framework known as the Standard Model, and the most common one was the first one discovered: a collision in which the strong nuclear force creates a pair consisting of a top quark and its antimatter cousin, the anti-top quark. Collisions that produce a single top quark through the weak nuclear force are rarer, and the process scientists on the Tevatron experiments have just announced is the most challenging of these to detect. This method of producing single top quarks is among the rarest interactions allowed by the laws of physics. The detection of this process was one of the ultimate goals of the Tevatron, which for 25 years was the most powerful particle collider in the world. Searching for single top quarks is like looking for a needle in billions of haystacks. Only one in every 50 billion Tevatron collisions produced a single s-channel top quark, and the CDF and DZero collaborations only selected a small fraction of those to separate them from background, which is why the number of observed occurrences of this particular channel is so small. However, the statistical significance of the CDF and DZero data exceeds that required to claim a discovery. The CDF and DZero experiments first observed particle collisions that created single top quarks through a different process of the weak nuclear force in 2009. This observation was later confirmed by scientists using the Large Hadron Collider. Scientists from 27 countries collaborated on the Tevatron CDF and DZero experiments and continue to study the reams of data produced during the collider’s run, using ever more sophisticated techniques and computing methods. What happens when protons and antiprotons collide? To answer this question, we first need to consider what we mean by a particle collision. The proton is not fundamental: It contains an evolving mixture of quarks, antiquarks and gluons. These quarks and gluons are collectively called partons and are held together by the QCD interaction, like marbles in a bag. While the marble metaphor is flawed in many ways, like most real-world imaginings of quantum behavior, it provides a helpful analogy to consider the various possible outcomes of particle collisions, so let’s go with it. Protons and antiprotons are composite objects, formed from a constantly changing mixture of quarks and gluons (partons). In a small fraction of collisions there can be more than one parton-parton interaction. Measuring the rate of such double interactions provides important information about the structure of the proton. The most common outcome of a proton-antiproton collision is that the two hadrons simply break apart — the two bags of marbles break — weakly scattering the internal quarks and gluons. This is called a “soft” interaction. The collisions that we are usually interested in are those in which a parton from the proton interacts directly with a parton from the antiproton in a “hard” scattering process that can produce new particles such as Higgs, W and Z bosons and other quarks. In our analogy, this would be two marbles, one from each bag, hitting each other and breaking apart. 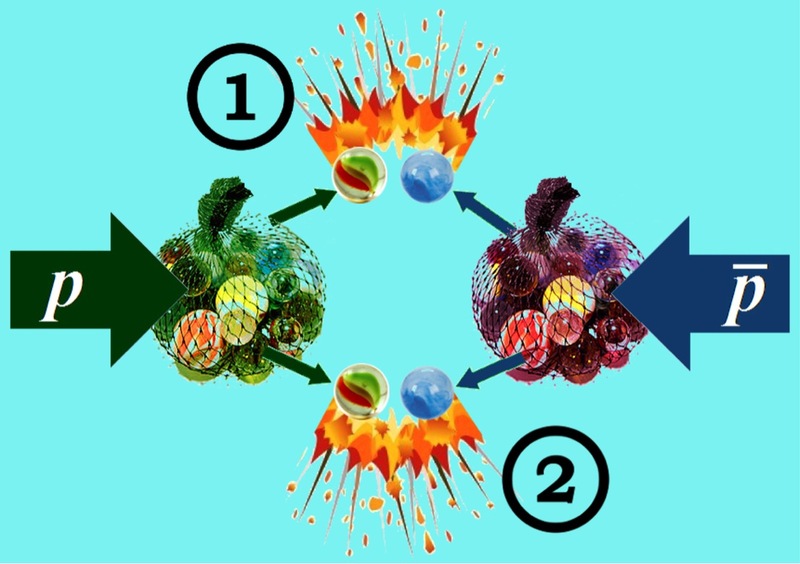 Occasionally, however, there can be more than one hard interaction per collision: In other words, two separate pairs of marbles smash together or two pairs of partons interact. These so-called double-parton interactions are much rarer than the usual single parton case, and their prevalence provides important information on the spatial distribution and transverse momentum of the quarks and gluons inside the proton. This week the DZero collaboration will release a new publication, measuring the rate of double-parton interactions using events with three quarks and a photon in the final state. The measurement uses a clever feature of the data to improve the precision: Sometimes two single-parton interactions can occur in separate proton-antiproton collisions. In our analogy, two bags of marbles collide at point A, and another two collide at point B. By comparing the number of selected events with one versus two separate collision points, the ratio of single- to double-parton interactions can be extracted with minimal reliance on the details of the detector efficiency. Furthermore, particular characteristics of the double-parton events allow them to be identified by their experimental signature and discriminated from the main backgrounds. The final results are expressed in terms of an effective cross section (the transverse area in the (anti)proton occupied by the interacting partons) and are the most precise ever made. In addition, for the first time the measurement is also performed separately for events where one of the partons was a heavy quark (beauty or charm). Interestingly, the measurement indicates that the probability of a double-parton interaction is the same regardless of the flavor of the initial parton: Unlike most of us, parton interactions don’t seem to be influenced by charm and beauty! The most visible legacy of the two Tevatron experiments is the still-expanding set of many hundred publications, describing world-leading measurements of the particles and forces that govern our universe. A less obvious, but still vital accomplishment is the innovation, development, and verification of the fundamental analysis techniques required to perform these measurements — techniques that have already been exported for use at the next generation of experiments at the LHC and beyond. The jet energy scale correction is used to determine the true energies of particle jets from the measured energy deposits in the DZero calorimeter. It accounts for many types of experimental effects, such as electronic noise, uninstrumented parts of the detector and interactions of particles before they reach the calorimeter. Such corrections are essential for almost all analyses performed at the DZero experiment. Experiments at particle colliders are often described as “recreating the big bang”: making new particles out of energy, and then watching to see what happens. 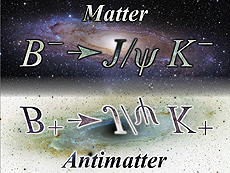 In almost all such experiments, we find that matter and antimatter are produced in equal amounts, and this is consistent with our current model. However, if the big bang followed the same rules, all the matter and antimatter would have mutually annihilated, with nothing left to form stars, planets and life. The very fact that we exist, and observe a matter-dominated universe, shows that our picture of the particle interactions is not complete. At the DZero experiment, scientists have spent a decade studying this matter-antimatter asymmetry using muons produced in their detector, and last week they released their final results. 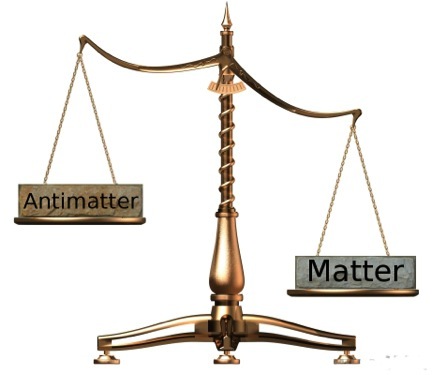 The measurement counts the number of observed muons (negatively charged) and antimuons (positively charged) to compare the amount of matter and antimatter resulting from the originally symmetric proton-antiproton collisions. As an analogy, this is much like weighing the matter and antimatter with a set of scales. The challenge is that the scales themselves introduce their own asymmetry into the measurement. Because the detector is built out of matter, it responds slightly differently to matter and antimatter particles as they are detected. These “detector effects” must be precisely determined before the measurement can be made. Luckily, the DZero detector has some clever attributes that make it uniquely suited for this kind of analysis. The new measurement uses the DZero detector like a set of scales, weighing the amount of matter and antimatter. However, the scales are themselves asymmetric, and the main challenge is to understand and quantify the effect of this behavior. Intriguingly, after correcting for the detector effects, the results indicate a statistically significant asymmetry in the number of same-charge muon pairs, with around one part in 400 more pairs of negative muons than positive muons. This is much larger than can be accounted for by current theories, suggesting the presence of additional as-yet unknown processes that favor the production of matter over antimatter. Now, assuming that this isn’t a very unlikely statistical fluctuation, the big question is: What could be causing this asymmetry, and could it be the same process that helped shape the early universe? Future precision measurements of specific asymmetries, as well as theoretical developments, are needed to help understand this puzzle. “CDF’s physicists have been searching for the Higgs boson since the early days of Run I, publishing their first paper on the search in 1990. 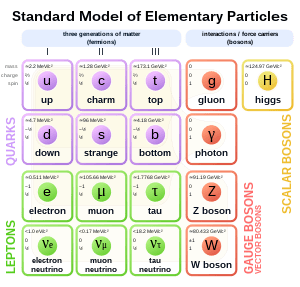 If you asked any of them why they did it, they would say it was to learn about what breaks the symmetries of the Standard Model, which is so successful in explaining the data observed at Fermilab and at other particle physics laboratories. Particles cannot have masses if these symmetries hold true, and the Higgs mechanism is the simplest, but not the only, way to resolve this dilemma. On July 4 of last year, two independent experiments at CERN, ATLAS and CMS, announced the observation of a Higgs-like boson. 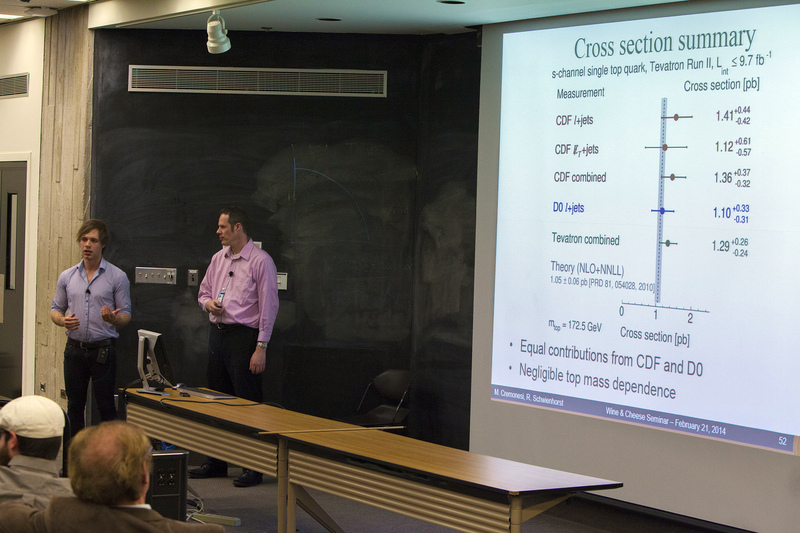 On July 27 Fermilab’s CDF and DZero experiments submitted a combined analysis showing evidence for a Higgs-like particle. The experiments at CERN were primarily finding the decay of the Higgs-like particle into bosons, while the experiments at Fermilab were finding the decay into fermions. CDF sought the Higgs boson in many production and decay modes over the years. These searches have now been finalized and documented. The combined results of all of these analyses have been put together and are the last pieces of the chain. Each analysis relied upon the excellent performance of the Tevatron collider and the CDF detector. The collaborations will soon submit a new paper that finalizes the combined CDF and DZero result. Best-fit cross section for inclusive Higgs boson production, normalized to the Standard Model expectation, for the combination of all CDF search channels as a function of the Higgs boson mass. The solid line indicates the fitted cross section, and the associated shaded regions show the 68 percent and 95 percent credibility intervals, which include both statistical and systematic uncertainties. 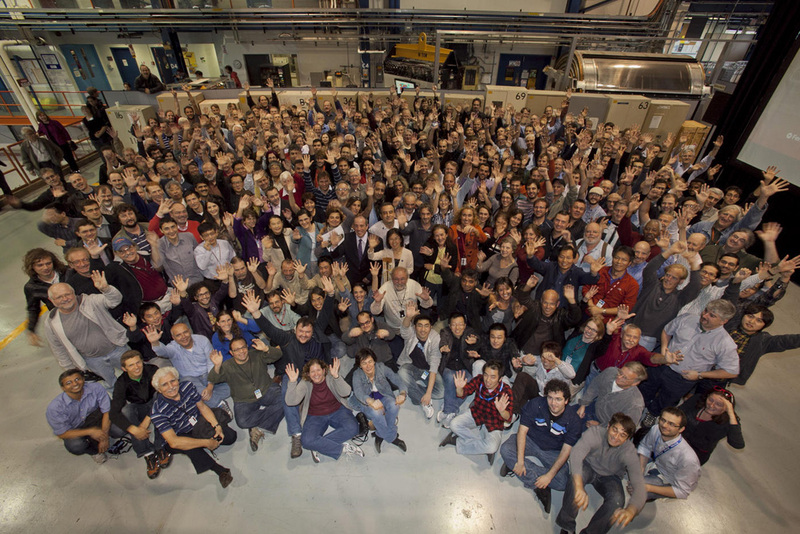 A “Higgs event” from CMS at CERN. … Because it has many ways of being produced and decaying, Higgs boson events have numerous signatures, and a particular signature may be shared by multiple production and decay modes. After a signature is identified, it must be deciphered while considering all possible sources of signal and background. A recent result from DZero focuses on the study of one specific signature, consisting of an electron or muon, missing energy indicating a neutrino, and two or more jets of particles. See the full article here, and understand that while the Tevatron is no longer operating in the hunt for Higgs, its story is not yet finished. There is still a great deal of data to be analyzed.